Today’s Sunday Express carries an article by Ben Borland, headlined ‘Rage at blood money’ from Megrahi book. Here is my response. The article extracts are in italics. 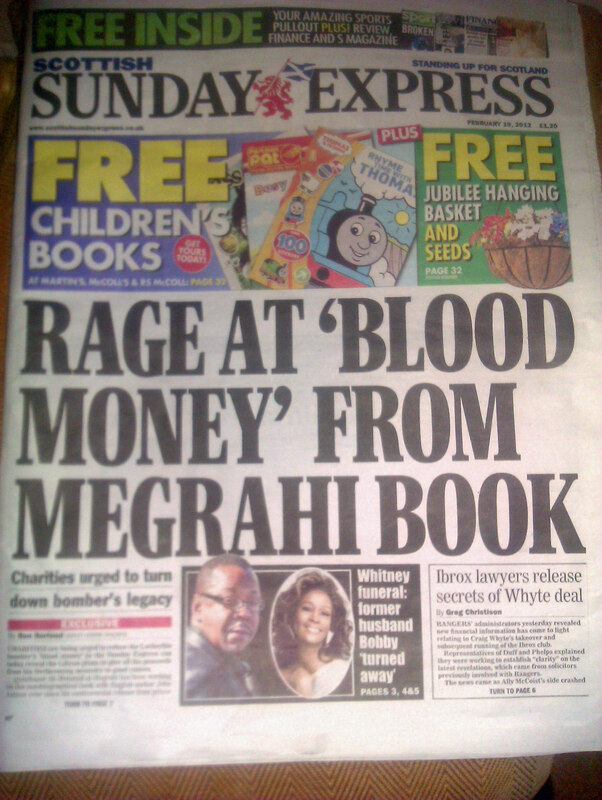 CHARITIES are being urged to refuse the Lockerbie bomber’s ‘blood money’ as the Sunday Express can today reveal the Libyan plans to give all the proceeds from his forthcoming memoirs to good causes. Whoops, the article falls at the first fence. Abdelbaset was never in line to receive any of the proceeds, because it is not his book – it’s mine. He does not have a contract with the publisher and never has had. Abdelbaset Ali Mohmed al-Megrahi has been working on the autobiographical book with English author John Ashton ever since his controversial release from prison in August 2009. Edinburgh-based publisher Birlinn is to unveil Megrahi – You Are My Jury: The Lockerbie Evidence on February 28 and is planning to donate all the profits to charity. True, although it’s unlikely that either Birlinn or I shall make a profit. But last night Susan Cohen, whose daughter Theodora was among the 270 victims of the 1988 PanAm bombing, urged charities to turn down any offer of cash from Megrahi. “I don’t think that anyone should accept money from that man,” she said. “I don’t think any charity should take a dime, they should not be encouraging this kind of thing. Some charities have been supportive of Abdelbaset and at least one has publicly stated his innocence. Birlinn’s managing director Hugh Andrew confirmed that no charities had been approached so far, although victim support organisations in Britain and the United States may be given first refusal. Mrs Cohen, who sent back £3.1million in compensation from the Gaddafi regime, describing it as “blood money”, said the plan was an attempt to “validate Megrahi’s actions”. Speaking from her home in New Jersey, she said: “It is a whitewash. If a charity accepts money then it implies they are accepting the verdict of the book and it puts a kind of validation on Megrahi’s actions, so that would be deplorable. The book is not a whitewash in any sense. At Abdelbaset’s insistence, it presents the case for the prosecution as well as the defence and invites readers to reach their own judgement. The new book promises to present “conclusive new evidence” to prove Megrahi was “an innocent victim of dirty politics, a flawed investigation and judicial folly”. In it, Megrahi will claim to reveal for the first time “how I came to be blamed for Britain’s worst mass murder, my nightmare decade in prison and the truth about my controversial release”. However, Mrs Cohen dismissed the claims as “self-serving” and also criticised Mr Ashton, who worked for Megrahi’s defence team and has written extensively about the Libyan’s innocence. She said: “I don’t think he can be in any way an objective person, given his very close ties to the former Libyan regime. It is just another part of the campaign to pretend that Megrahi didn’t do it. I worked alongside Abdelbaset’s legal team for three years, during preparations for his second appeal. The appeal was funded, ultimately, by the Libyan government. We were not instructed by the government and had minimal contact with its officials. Both my books on Lockerbie describe Gadafy as a brutal dictator. “Why should we believe anything that Megrahi says? If he had anything to reveal, he should have revealed it at the trial. It’s a fair point: on the advice of his lawyers, Abdelbaset opted not to give evidence at trial (a decision he regretted, although it’s debatable that the outcome would have been any different if he had decided differently). The book presents the account that he would have given at trial and leaves it to the readers to judge. Moreover, it presents a great deal of evidence that the court never heard, much of which was concealed from the defence by the Crown. “It won’t bring my daughter back but it would help if there were no more of these things which are self-serving and only cause confusion. Abdelbaset and I are acutely aware of the anguish that the book might cause the Lockerbie victims’ relatives who believe him to be guilty. We simply wish them and the wider public to know all the important evidence that was available to us, most of which has previously been concealed from the relatives and was not aired at his trial. The answer is, with great difficulty. As I have written elsewhere on this blog, the writing process was very arduous. If Abdelbaset was guilty, then he would surely not have spent so many of his last days cooperating with an author. Megrahi was reckoned to be just three months away from dying of prostate cancer when he was freed by Justice Secretary Kenny Mac-Askill 30 months ago. Wrong. No one said Abdelbaset had three months to live, rather they said three months was a realistic prognosis. At the time, eight years into a 27-year sentence, he was part-way through an appeal granted after the Scottish Criminal Cases Review Commission ruled that his conviction may have been unsafe. Hugh Andrew, Birlinn’s managing director, yesterday defended his decision to publish the 59-year-old father of five’s memoirs. He said: “We will make the offer to various charities and I understand perfectly well that some may not wish to receive money, it is entirely their call. “It would be inappropriate for us to make any profit out of this book and we are not seeking to make any. Megrahi himself will receive no money at all. “I absolutely defend our right to publish this book. It is not a statement on his innocence or guilt but he has the right to have his case in the public domain. Brighton-based Mr Ashton co-wrote Cover-up of Convenience: The Hidden Scandal of Lockerbie in 2001 and worked on The Maltese Double Cross television documentary, which infamously alleged a CIA drug smuggling connection to the atrocity. At least those bits are true – well done Ben Borland.